One of the most problematic borders in the world today: but every border, though a limit, is also an overlap. I cite this not as a paradigmatic definition, but because it is the most recent reference I have on borderlands. When I was looking up information on borderlands today I found that there is an entire journal devoted to their discussion, Journal of Borderlands Studies, so one can expect that borderlands have received many definitions and have been conceived in many ways. Geographical regions have borderlands in space. Geopolitical entities have borders in both space and time. For that matter, we can identity the borders — well-defined or ill-defined — of almost any temporal phenomenon. That is to say, anything that exists in time will have a temporal border at its beginning and at its ending — when it comes to be from something it is not, and when it ceases to be and cedes its place to something that it is not (to employ Aristotelian language). When I was thinking about it today, it struck me that there are moral borderlands, and moral borderlands, like geographical borderlands, are regions of tension and conflict. While I am sure that there are a great many examples that might be adduced, I am going to discuss only two of them that happen to be on my mind at present. Several times I have cited an earlier post of mine, Social Consensus in Industrialized Society, in which I suggested that, in the wake of profound social changes wrought by industrialization, that societies have been casting about for a robust and sustainable way to live with the consequences of industrialization. In the terminology of today’s post, I would now say that the periods of transition between social models are moral borderlands. A consensus on social organization means a moral consensus on what is acceptable and what is not acceptable within a given society. When one form of social order is breaking down and another is in formation but still inchoate, the moral conventions of the two different social models often clash. What is right for one age, is not always right for a later age, and at the point of time when those ages overlap, there is moral conflict between the representatives of the old order of society and representatives of the new order of society. Moral conventions are deeply integral with the totality of social conventions, and indeed in a fine-grained account of social life there are a great many cases in which it would be problematic at best to distinguish what is a moral convention from what is a mere social convention without moral force. This may be less apparent today, in an age of relative tolerance and rapid change, but it is true to some degree even now. In the agricultural economy of the pre-industrialized world it was commonplace for people to have large families. Children were put to work on a farm as soon as they were physically capable of even the smallest task. Another pair of hands was always needed for the labor-intensive task of subsistence farming, and having a large family also had the added benefit that, in the unlikely event that one lived into old age, there was a higher likelihood that at least one child would be willing to care for the aged parent in a world with no social safety net whatsoever. The alternative to being supported by a child was the most object poverty imaginable. 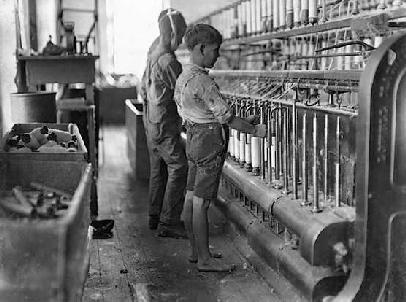 The misery of working conditions in the early periods of industrialization was compounded by the acceptance of institutions such as child labor. If children routinely labored on the farm, why should they not labor in the factory? It took time to sort this out. For the subsistence farmer, a large family is “good.” Many other things are good as well, and the subsistence farmer is not likely to distinguish between eudaemonistic goods that make for a better and more comfortable life and strictly moral goods. As I noted above, in many cases it would be difficult to draw the distinction in any kind of rigorous way. The way of life is completely integral with the conceptions of life’s goods for the two to be separated without violence. The first social consensus of industrialization included features now understood to be exploitative and inhumane. The Industrial Revolution emerged in this context. Families displaced from rural circumstances for a variety of different reasons, or simply drawn to the growing cities for their intrinsic attraction, did not suddenly change their moral outlook upon moving into the city. A large family was still good. 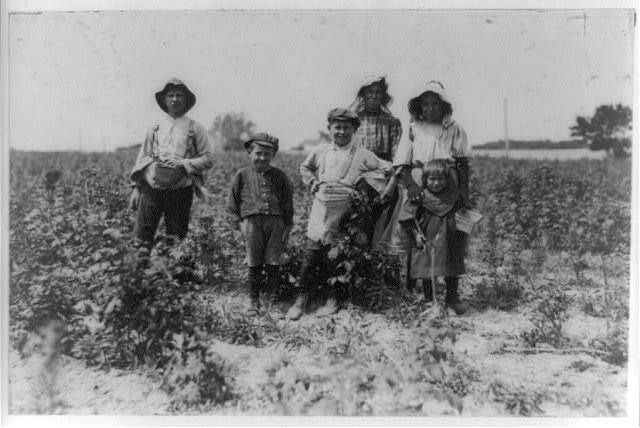 So people continued to have large families, and they put their children to work in the factory system as soon as they were able, just as they would have put them to work on the farm as soon as they were able to do farm chores. We now look upon industrial-scale child labor as a great evil, but it emerged from a moral borderland. The way of life of country people was retained after their move into cities, and it took time for this to change, just as it also took time for the factory system to demand skilled and educated labor. 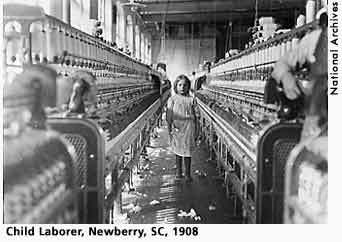 It is easy for us to condemn child labor and consign it to the horrors of early industrialization, but it is more important to try to understand how it came about — it didn’t come out of nowhere, but from the context of lives in the midst of change. Another instance of moral borderlands that is on my mind is the use of nuclear weapons. 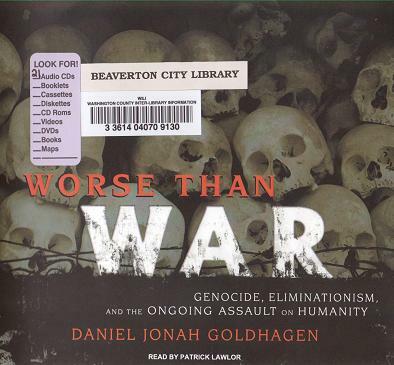 I mentioned in a couple earlier posts (Revolution, Genocide, Terror and The Threshold of Atrocity) listening to Worse Than War: Genocide, Eliminationism, and the Ongoing Assault on Humanity. The author begins with an uncompromising indictment of Truman as a mass murderer because of his decision to use newly available nuclear weapons to destroy Hiroshima and Nagasaki. Not long after the end of World War Two, and throughout much of the Cold War, it became commonplace to speak of nuclear war as “the unthinkable.” And certainly in the context of mutually assured destruction, nuclear war had become unthinkable. But when the first nuclear weapons were made available, there was no conception whatsoever of nuclear war, and the use of the most recent weapons technology was far from unthinkable. On the contrary, the failure to use a new weapons technology in a war would be more unthinkable than the reverse. The end of the Second World War saw the introduction of nuclear weapons, so there is a sense in which the Second World War was also the First Nuclear War. But we don’t think of it that way. The Second World War saw the introduction of many transformative technologies such as digital computers for code making and code breaking, ballistic missiles, and jet fighters. No less important were social technologies of military doctrine that both began and ended the war. German’s Blitzkrieg over Europe was a new doctrine, a new social technology, for existing armaments, just as the firebombing of Dresden was a new doctrine for the use of existing armaments. The war made men become clever in diabolical ways. 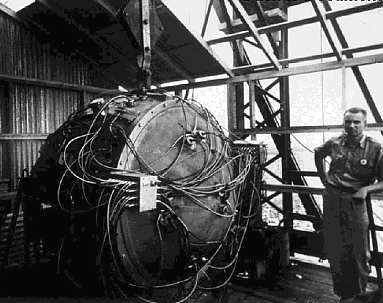 Nuclear weapons technology was one among many new technologies employed in the Second World War. The Second World War was the culmination of mass warfare, the predictable outcome of the emergence of an industrialized society based upon mass man. We will probably not see its like again any time soon. 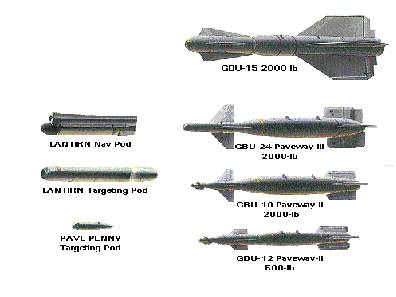 The age of precision munitions is upon us, and this has already changed war dramatically. When we look at the casualty numbers of earlier wars and compare them to the casualty numbers of recent wars, the truly remarkable thing is how low casualties are now. While the role of intensive media coverage gives the impression of mass suffering, in fact far fewer people are suffering from war than during the twentieth century. It sounds heartless and cruel to say it straight out like that, and it is cold comfort to those who are suffering from war, but it is nevertheless true. At least for the time being, the age of mass war is over. Though over now, as we noted above, the Second World War was the culmination of mass war, and nuclear weapons are the culmination of weaponry for mass war. Nuclear weapons aren’t good for anything except mass war, and they created a paradigm of mass war that became unthinkable the more it was thought about. But just as it took time for the evils of mass child labor to become apparent, so too it took time for the evils of mass nuclear war to become apparent. For those who condemn Truman for his decision to drop the bomb, there are a great many contemporaneous quotes to draw upon of those who saw clearly the nature of nuclear war. But the end of the Second World War was a moral borderland, and in the borderland there are two moralities and an underlying tension. This morning on twitter I jotted down a few quick notes that partially reflect the fact that I am presently listening to a couple different books about war: Firestorm: Allied Airpower and the Destruction of Dresden, by Marshall de Bruhl, and A Savage War of Peace: Algeria 1954 – 1962, by Alistair Horne. As I was capturing a few thoughts about contemporary warfare, it dawned on me that my thoughts on war can be given an interesting Marxist formulation. If there is anyone who reads this forum on a regular basis you will know that, despite my clear differences with Marx, I often end up citing and quoting him, and I will further develop my quasi-Marxist reflections today. One of the features of Marx’s thought that retains its value despite the problematic nature of so much Marxist theory is that of the distinction between economic base and ideological superstructure. There should be a name for this distinction and the view of society that it implies, but I am not sufficiently up on Marxist studies to know if there is a term that is commonly used within the discipline, so at present I will refer to it as “the economic interpretation of history”. I wrote about this last week in relation to Joseph Campbell’s use of the phrase, and there I said that I didn’t know exactly what Campbell meant by it. Well, this is as good a meaning as any for the phrase, and indeed I think it sums up the idea Campbell meant to criticize quite nicely. We could even say (with a certain flourish) that the fundamental theorem of the economic interpretation of history is that the ideological superstructure of a society is completely determined by the economic base of the same society. This uncompromising statement of the fundamental theorem of the economic interpretation of history is a perfect instance of reductionism as well as of constructing a theoretical absolute. Reductionism is mostly out of favor among contemporary thinkers, though it is not without its advocates, and constructing a theoretical absolute can be little different than erecting a straw man. There are obvious re-formulations of this theorem that are far less rigid, and thus far more likely to be true, or, at least, to have some truth in them. For example, we could say that the economic interpretation of history is the principle that ideological superstructure is mostly determined, or somewhat determined, by economic base. Or, hedging even more, that ideological superstructure is determined at least in part by economic base. It would be foolish to deny the latter outright, so we see that between an absolutist and uncompromising statement of a principle, and a thoroughly hedged statement there can be the difference between night and day. But rather than conditionalize, compromise, or hedge, I would like to go in the direction of greater abstractness and generality. In other words, I would like, for the moment, to pursue an even more thorough-going reductionism, all in the interest of philosophical principle. When thinking about it this morning, I was struck by the obvious fact that Marx’s formulation of the economic interpretation of history can be generalized. Rather than limiting our foundations to economic foundations, any social system whatever can be seen as the social base of a society, while any cultural or intellectual expression of a people is a wider field of ambition than political ideology in the narrow sense. Thus a generalization of Marx’s principle would be that social conditions determine the life of the mind. Once again, if we hedge and say, “Social conditions, at least in part, determine the life of the mind,” we have a proposition with which few will disagree. Now, to war. War is one form of social organization. Indeed, it is a pervasive form of social organization throughout human history. There are important respects in which war is an expression of human culture. It is then to be expected that the social conditions of a society at war are expressed in the methods by which that society makes war. Since the end of the Second World War, there was been much discussion of strategic bombing. An explicitly philosophical treatise has been written to denounce it as immoral (A. C. Grayling’s Among the Dead Cities: Was the Allied Bombing of Civilians in WWII a Necessity or a Crime?). Caleb Carr denounces it in his The Lessons of Terror. Firestorm, mentioned above, questions the utility and rationale of strategic bombing. But, if I am at least partly right, it is misleading to try to understand strategic bombing in exclusively moral or political terms. Strategic bombing is an expression of our culture. Once we see it in this context, it seems rather obvious. 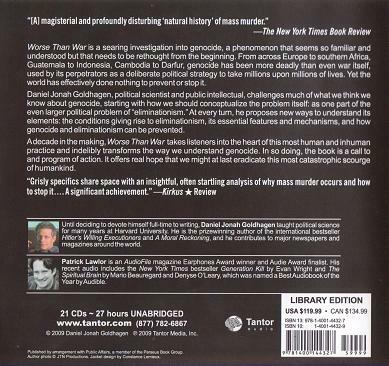 Hannah Arendt is especially remembered for her argument that twentieth century totalitarianism and fascism is a political outcome of the emergence of mass man in history. I would argue that mass warfare is also a nearly inevitable historical outcome of the emergence of mass man. Today we have mass war for mass man. It may be horrific, but it is not to be treated as some kind of anomaly: this style of warfare perfectly matches the structure of society today. 1. Influencing policy through mass terror could have no place before popular opinion was crucial to the formulation of policy. 2. The limited war of earlier ages corresponded to the drastically limited sovereignty of non-democratic institutions. 3. Where vox populi is law, to shift the feeling or perceptions of the people, through terror or other means, is a coherent strategy. 4. Twentieth century campaigns of mass death and strategic bombing are brought into being (not justified) by popular sovereignty. 5. The ideological superstructure of modern war (mass war) supervenes upon the social and economic base of modern human life (mass man). 6. Mass war is a product of the Age of Mass Man.